The purpose of this survey was to assess the current level of cover crop use and gather insights from farmers in Nebraska regarding the use of cover crops. This survey was conducted in January and February of 2015 using paper surveys distributed to farmers attending Pesticide Safety Education Program Courses, Crop Production Clinics and those attending the Nebraska no-till conferences. A total of 258 farmers who attended these meetings participated in the survey. There were multiple versions of the survey with varying questions and not all participants completed every question; therefore, the number of responses that were analyzed for each question is indicated (n=number answering). Figure 2. Percent of farmers who managed operations of various sizes in the 2014 growing season and either planted or didn't plant cover crops. The profile of income sources of those who did plant cover crops (n = 87) and those who did not (n= 171) appeared to be similar, with 76% of those who planted cover crops and 77% of those who did not plant cover crops having over 50% of their income from grain crop production. Of the farmers who did not plant cover crops, 63% reported having no off-farm income and 35% had some income from livestock production. Similarly, of those who planted cover crops 66% had no off-farm income and 46% had some income from livestock production. Those who did not plant cover crops reported that 48% of the acres they managed were used to produce dry corn grain and 31% were used for soybean production. Similarly, those who planted cover crops reported that 42% of their acres were used to produce dry corn grain and 32% were used for soybean production. However, size of operation did appear to differ. Of the farmers who planted cover crops, 33% (29/87) had operations greater than 1,500 acres while only 17% (29/171) of farmers who did not plant cover crops managed more than 1500 acres. Both those who planted cover crops (44%; 11/25) and those who did not (49%; 61/124) ranked time and labor required as a major issue to its adoption. 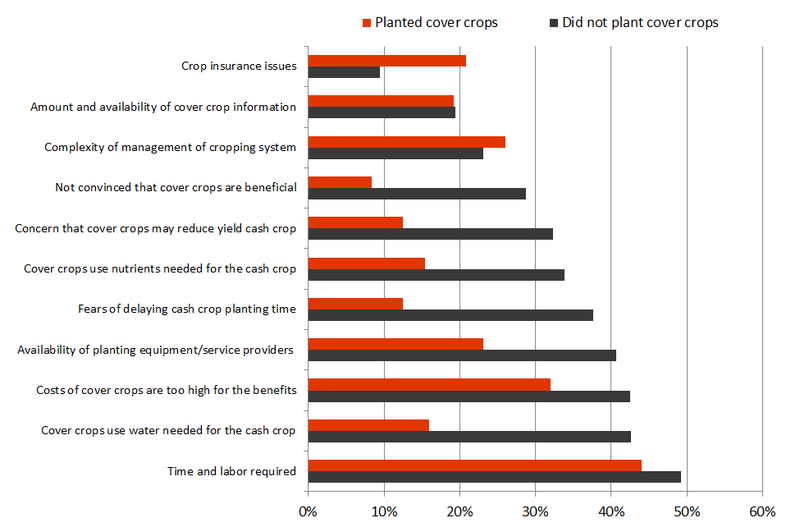 The cost of cover crops relative to the benefits was also ranked as a major issue by both those who planted cover crops (42%; 8/25) and those who did not (32%; 51/123). Water use was reported to be a major issue for those who did not plant cover crops (43%; 53/125); while only 16% (3/24) of those who planted cover crops reported water as a major issue. Figure 3. 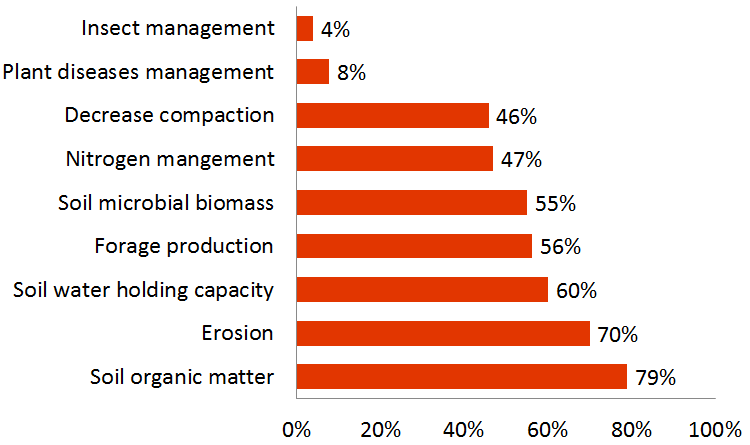 Factors rated as major barriers to the use of cover crops by farmers that planted cover crops and those who did not plant cover crops in the 2014 growing season. Of the 27,589 acres that were reported by the 87 farmers as being planted to cover crops, 23% were planted in the fall after corn silage. However, corn silage acres only made up 6% of the acres managed by those planting cover crops. When evaluated as a percent of the corn silage acres managed by those who planted cover crops, 77% of corn silage acres managed were planted to cover crops. When compared across all the corn silage acres reported by all participants (12,283 acres) in this survey, 51% of the corn silage acres were planted to cover crops. 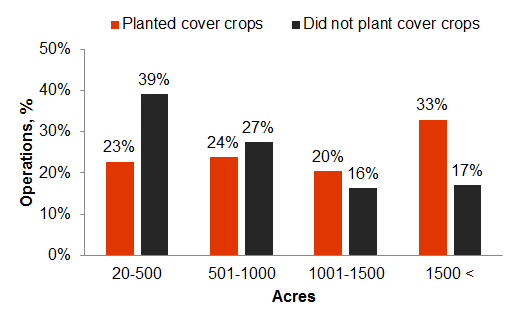 Cover crops planted in seed corn production represented 10% of the cover crop acres planted. 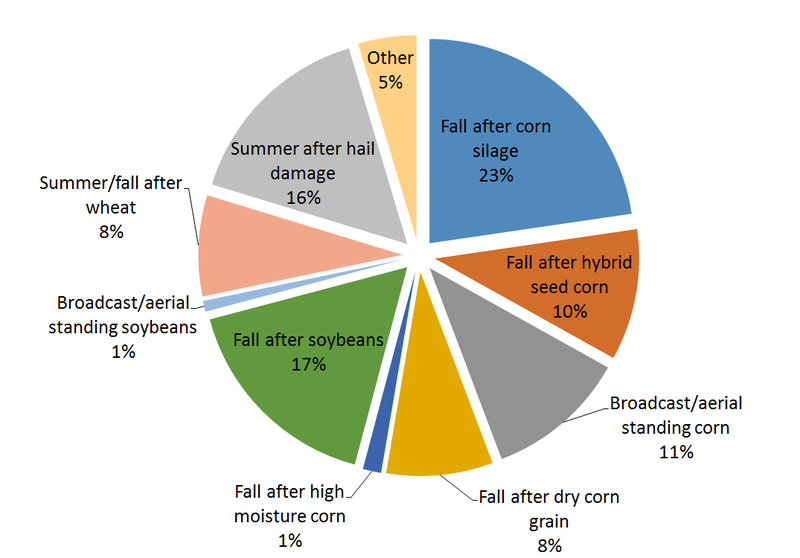 As with corn silage, seed corn acres made up a relatively large proportion of the cover cropped acres when considering the total number of cropped acres in seed corn production. Cover crops were planted on 32% (2870 of 9062 seed corn acres) of the seed corn acres managed by the participants of this survey. Of the cover crop acres planted,18% were planted in the fall after soybean harvest or broadcast seeded into standing soybeans. This only represented 11% of the soybean acres managed by farmers who planted cover crops. When compared across all the soybean acres reported by survey participants (106,740 acres), only 4% of the soybean acres were planted to cover crops. Similarly, the dry corn grain and high moisture corn acres made up 20% of the cover crop acres planted, but only represented 3% (5806/ 181,288 acres) of the corn acres managed by the participants in this survey. Figure 5. Factors rated as a major reason for planting cover crops by farmers who planted cover crops in the 2014 growing season. Building soil organic matter and preventing soil erosion were the most often reported (79% and 70%, respectively) major reasons for planting cover crops among farmers who planted cover crops (n = 80). Almost 50% of the participants also responded that increasing soil water holding capacity, producing forage, improving soil microbial biomass, scavenging or fixing nitrogen and decreasing compaction were major reasons they planted cover crops. Insect and plant disease management were not a reason for the majority of farmers who planted cover crops in 2014. Of the 38 farmers responding to the question on number of acres of planted to various cover crop species, the majority (25) planted brassicas (turnips, radishes, collards, etc.) with 60% of the cover crop acres containing a brassica. 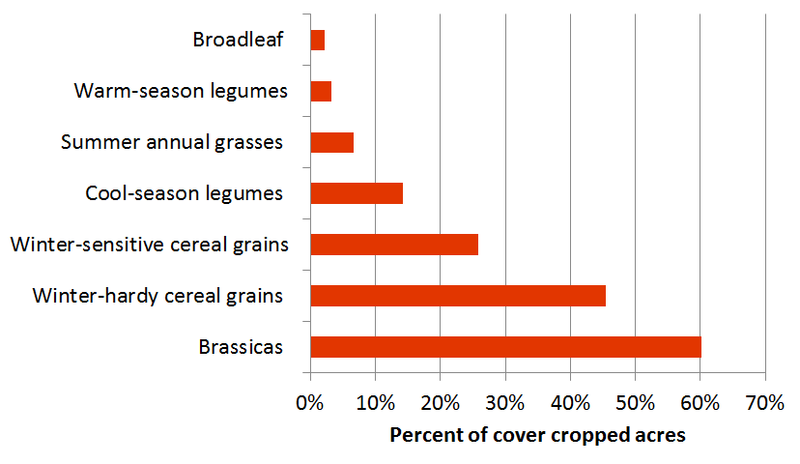 The second most commonly used class of cover crop was winter hardy small cereal grain. These were planted by 20 of the 38 farmers, resulting in 45% of the cover crop acres containing one of these species: cereal rye, winter wheat, winter barley or winter triticale. Only 8 of the 38 farmers planted winter-sensitive cereal grains (oat, spring wheat, spring barley or spring triticale), resulting in 26% of the cover cropped acres containing a winter sensitive small grain. Figure 7. 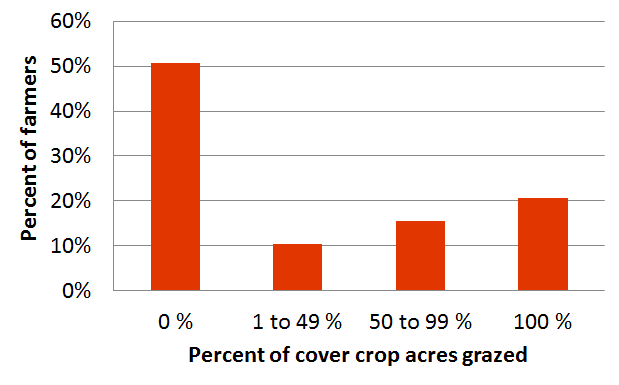 Prevalence of cover crop grazing. Of farmers who planted cover crops 51% (41/80) did not graze any of their cover crop acres, and 21% grazed all of the cover crop acres that they planted. The authors would like to thank all of the farmers who provided information. Without their willingness to take the time to complete surveys like this one, we would not be able to assess current management practices and determine research and education needs. A print-friendly copy of the Cover Crop Survey results is available.